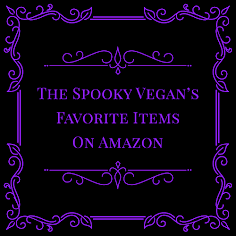 Here are my suggestions for vegan Halloween candy, which are sure to make your Halloween sweeter than ever! Chocolate Covered Cocomels - These are the perfect size to hand out to trick or treaters…that is, if you feel like shelling out $2 a pop for these cuties (available at Fresh and Easy stores)! At that price, I’ll be hoarding these babies all to myself! These chocolate-coated vegan caramels come in flavors like Espresso, Sea Salt and Vanilla will melt in your mouth! You can also purchase the original Cocomel caramels in the same flavors. 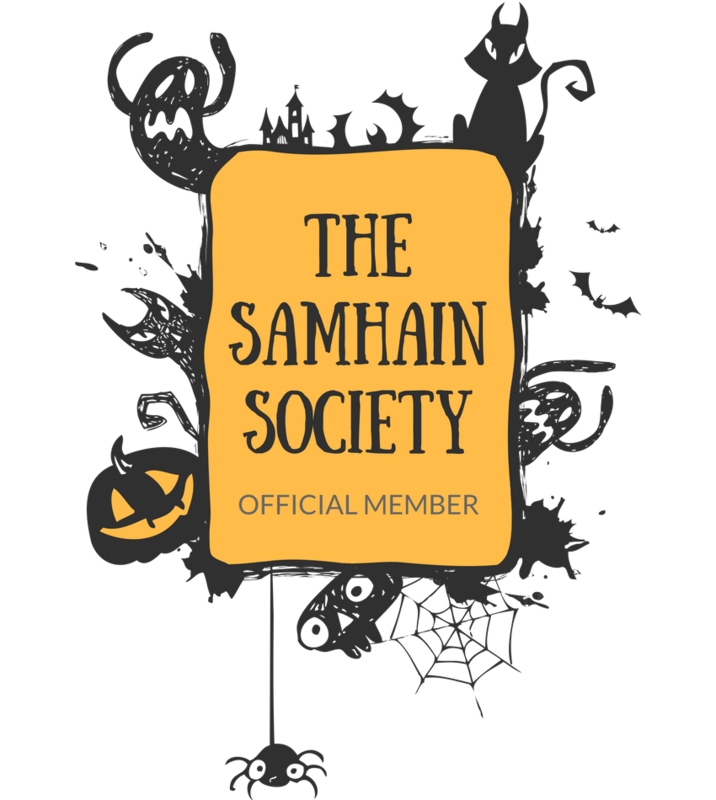 Sjaak’s Chocolates – Sjaak’s makes some of the best vegan chocolate I’ve ever tasted and would definitely be a treat for anyone this Halloween! I love their Eli’s Earth candy bars (my fave is the Treasure Bar, a solid layer of crunch peanut butter topped with caramel and coated in creamy ‘milk’ chocolate’!). They also have Halloween-themed candies available for purchase between September and October! Justin’s Dark Chocolate PB Cups – I can’t resist including these peanut butter cups in this list! 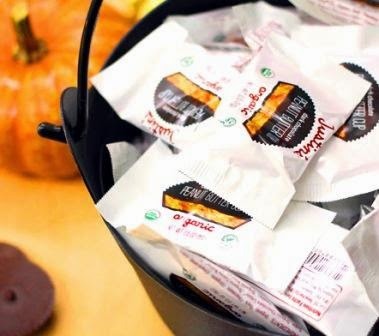 They usually have single-serve packs around this time of year that are wonderful for trick or treaters (hint: Costco usually carries the huge bag of these for around $10)! Make sure you grab the vegan dark chocolate variety, though – the other kind isn't vegan. Endangered Species Chocolate Bars – Endangered Species keeps upping their game! Just this year they released vegan cream-filled chocolate bars in wild flavors like Lavender! 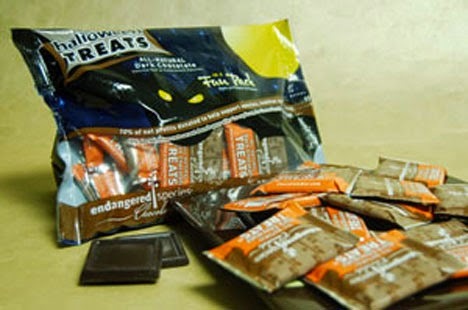 And they also make small, single-serve chocolate bars around this time of year for passing out to trick or treaters! I believe most (if not all) of their varieties are vegan, but double-check the labels just in case. Earth Balance PB Popps – This vegan peanut butter-coated popcorn is so addicting! 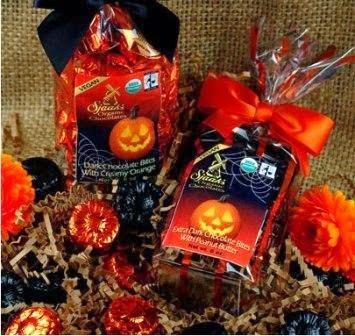 Spread the love by putting it in cute Halloween treat bags and handing out to your friends and neighbors! Unless of course you eat the bag yourself, which is a perfectly acceptable option as well. Go Max Go Candy Bars –Go Max Go has veganized pretty much all the popular candy bars, with flavors like Jokerz (Snickers), Thumbs Up (Butterfingers), Cleo’s (Reese’s), Snap! 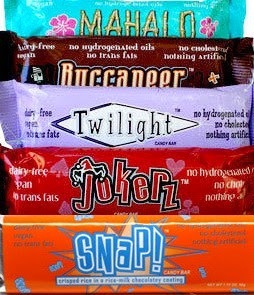 (Crunch), Buccaneer (3 Muskateers), Twilight (Mars), Mahalo (Almond Joy/Mounds). You can now be like one of these cool houses that passed out full-size candy bars, but even cooler cuz all Go Max Go bars are vegan! 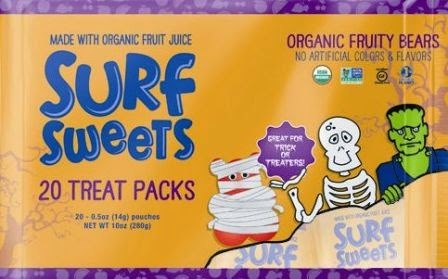 Surf Sweets – Looking for some gummies that are also vegan? Surf Sweets makes several vegan varieties, including Sour Worms, Fruity Bears and Watermelon and Peach rings! They also have a Halloween Treats pack that is vegan! Always check the labels, though, as they have several other varieties that are not vegan. Or, you could just make your own vegan candy bars! 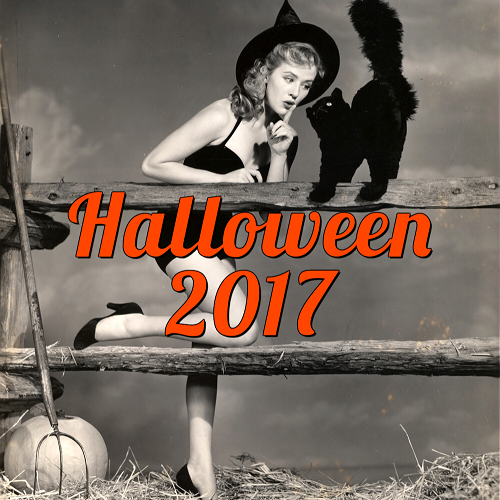 An excellent source for homemade candy bar recipes is the Fork and Beans blog, whose Ghost Pops I just featured the other day! 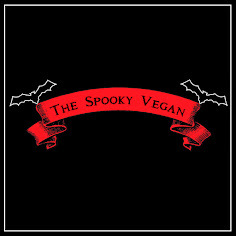 Do you have any favorite vegan candies this time of year? 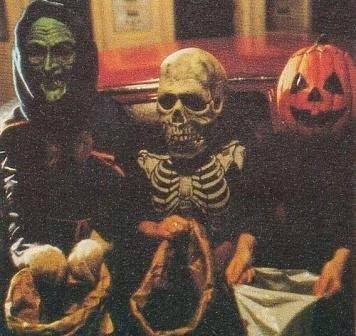 What kind of Halloween goodies do you hand out to trick or treaters on Halloween? Check out more of my recommendations for vegan sweets!